The sun bakes my skin, the blazing light makes my eyes wrinkle up and the dry air cuts into my lips. In the afternoon of June 7th, we arrived at the start of the Qarshi steppe. My two acolytes have been sick since we left Dushanbe in Tajikistan. Brian is never very talkative but I am used to dealing with that. On the other hand, Siphay is not the same person any more; he is immured in a deathly silence. I know something is wrong with him. His nausea may be making him irritable but there is something else troubling him as well and I can’t make out what… three and a half days and 380 km in an atmosphere that is undermining my spirits… I keep trying to break the ice and lighten the mood but to no avail. Conversation is kept to a minimum while jokes and banter are no longer part of our team repertoire. Silence is king and the court jester is banished to his cell. My thoughts go out to my missed ones in France and elsewhere and when a truck’s horn brings me back to reality, I catch myself thinking negative thoughts. Normally I enjoy greeting children who wave to us but these last few days it has felt something of an imposition. I don’t want to continue in this state of mind. I recall exchanges we have had with people on the road, and saying to them: « If one day, I find I am not happy any more when I wake up in the morning, I will know I have to change something in my daily routine until I get back my spontaneous smile ». The three of us are on the side of the road and our thermometers register 39°C in the shade. We are trying to stop a lorry that can carry the bikes. Brian needs the rest and Siphay won’t object. For three whole days now they have been kept going by sheer will-power, and progress is much slower than planned. The visa issue is pressing us to go faster. I know I can keep up the pace and decide to go on alone, hoping to get my good spirits back while the others hitch a ride. Curiously, this does not worry me. I have a profound conviction that I have taken the right decision for my well-being as well as for the team’s. I have about thirty-six hours to cover three hundred kilometres; above all I have time to rediscover the pleasure of greeting people welcoming me to their country. I leave my mates around 5.30pm, cycle non-stop till 11pm and do 154km as for a normal day. Music in my ears: I have escaped. I am not hungry, don’t feel tired, and keep going like a robot. The hours pass and I reflect on my relationship with my fellow travellers. We have been together all day and all night for almost three years now. We share our tent, our money and our meals. We cycle, walk, talk, argue, sleep, enjoy ourselves, lunch, dine, suffer and laugh together. It’s difficult for us to talk in the first person singular when we are asked “How are you?” We answer: “Weare fine!” … It is amazing to see how the br ain can be formatted, adapted and even get side tracked. We have reached a point where we think so much as a group that we have difficulty making strictly personal choices. The opinions of the other two become too important in the diminishing areas of privacy left to us. So much so that the day comes when one of us mistakes something that has happened to one of the others for his own experience. It is a sort of projection of identity. We see ourselves in the other person and we live his joys, his pains, his plans and even his guilt as if we ourselves were responsible, the prime movers. It seems to me important to understand this phenomenon and to learn from it, extracting the best and steering clear of its dark side. The torment Siphay has been going through these past few days may well be something not directly linked to him, but which he takes on by identifying himself with me. For my part, if the guys are sick, in a bad mood, or tired I have to learn to keep “me” away from “us”. By going off on my own, I separated myself physically. Next time, I may be able to do it mentally. Around 11.45pm, a shooting star ignites in the friction generated as it enters our atmosphere and I tell myself: “The next time I see one as big as that, it will be time to stop and sleep.” I like to believe that nature sends out signals that we can pick up by applying a little attentiveness and a lot of imagination. Fifteen minutes later, the sky duly beckons that I should stop in a patch of road works. There should be nobody about at this time of night. I make do with a piece of bread, a quick wash in water from my gourd and lie down beside my bike. I am alone in the steppe, enjoying my freedom. Freedom to choose and to think. It’s 4.45 am and I take advantage of the morning’s freshness to make a start. I can already feel my spirits reviving. I am beginning to enjoy smiling at people again, to greeting kids and answering « Franssouz » when asked: « Ad kou da? » (Where are you from?). Around 7am I reach the historical city of Bokhara. 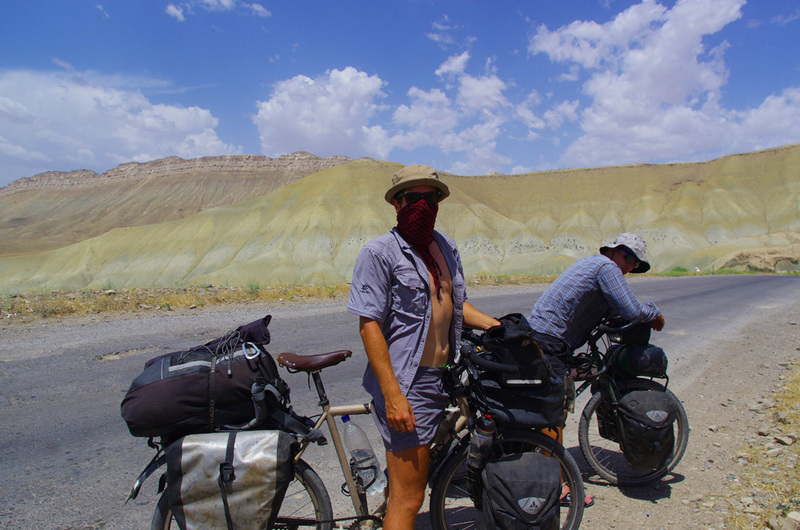 I overtake an Uzbek man on his bicycle and turn round to greet him. Immediately, I think to myself “This guy seems to be nice “. I slow down and wait for him to draw level. Narzuluo is the owner of a farm 15km south of the city, father of four children; he took part in cycling competitions as a young man. At 61 he exudes amazing energy. 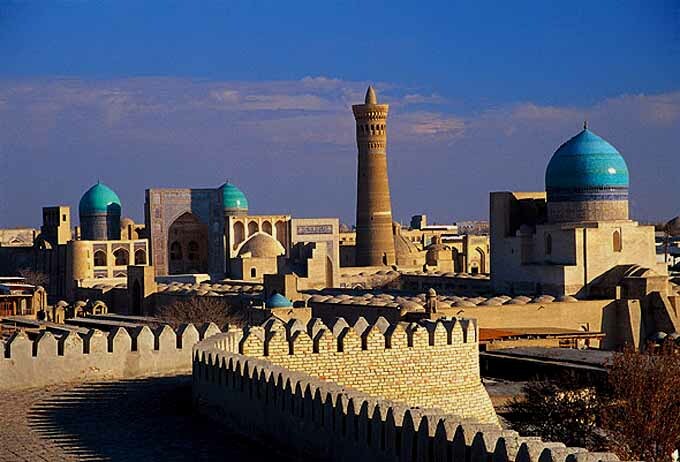 After ten kilometres, Narzuluo takes me around the little streets of Bukhara with their superbly carved buildings, and his enthusiasm to show me his home town of which he is so proud fills me with joy. He insists on inviting me to his house for the night but I have to say no. I explain that I have an appointment with my friends the next morning. I ask him if he can take me to a bank. I want to invite him to eat and drink tea before we part. He replies with rounded eyes: “Tomorrow you will be in Turkmenistan, Uzbek money will be useless. Take this for today”. He pulls from his pocket the equivalent of 5€ and when I don’t open my hand to take it he places it on my bicycle. I don’t know how to react but I have no intention of leaving with his money. Then he goes on being the jovial and energetic guide until we join up with a party of French tourists, retired people. Curious and friendly, my compatriots greet me warmly. I answer their questions and tell them about my lucky encounter with Narzuluo. I explain that he has just gave me some money despite the fact that I want to invite him to a restaurant… A new wave of solidarity surges forth and I find myself accepting two notes of 20 euros and few more in local currency. I thank them profoundly and head for the market with my mentor. Narzuluo helps me to fill up with fruit and vegetables purchased for a good price, and leads me out of the city. It is 10am and we are squatting on the side of the road washing cherries, tomatoes, apricots and cucumbers. We talk little but we understand one another, each enjoying the other’s company. He is happy pampering me and I rejoice that I have met him. Before we part I write down his address and telephone number and give him one Solidream postcard together with one of the 20 euro notes generously donated to me earlier that morning. I think he accepts because it is not a simple monetary exchange. The fact that this is euros and not local currency lends an extra meaning. It is like a personal gift, something that comes from my country. When he goes to change the money, it won’t diminish the value of what we have shared together. I cycle till midday, my counter already shows 100km and I have only had a small piece of bread to eat in the last 24 hours. I sit at the table of a small shaded cafe. I order a bottle of Coca Cola and the young Ravshan asks me to pay 4000 cym. I give him 3500 with a smile. I know he has inflated the price, and he knows I know. He laughs and takes the cash. A few minutes later I invite him, with his staff, to join me. I have fruits and vegetables for a regiment! Habib, the waiter, outdoes me with mutton on skewers and water melon, and the fest begins. I am rewarded with a good siesta on one of the beds they have put outside. It is 42°C on the terrace and I need to spray myself with water every 15 minutes. Around 6pm, I take to the road with a heart full of Uzbek hospitality and generosity. I cycle 183km that day and reach the border at 10pm without realizing I have arrived… After completing my ritual toilet, I ask the guards if I can sleep behind the gate for the sake of safety. They agree and I lie down beside my bike, at peace with with myself. I appreciated this small parenthesis. It allowed me to be alone and enjoy the independence that I sometimes miss. Above all I realised how often the world we experience is chiefly the reflection of our own state of mind. Negative thoughts predispose my brain to see bad things everywhere. Worse than that, I influence other people in their behaviour. Unconsciously, they pick up the negative signals and close in on themselves, adopt a defensive posture and lose their sense of trust. This not only clearly reduces the likelihood of enjoyable chance encounters, but it can also have a snowball effect in a team like ours. When things go wrong round me, I must learn how to look at what is wrong inside myself. This morning, I wake happy, to wait for the others in the shade of the Uzbekistan-Turkmenistan border post.